While our products play a role in how our skin appears on the outside do not underestimate the power of the foods you eat. 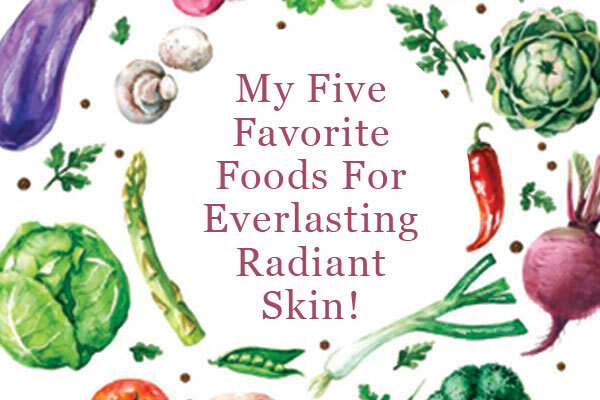 From my 16-year career as a practicing esthetician I have seen skin transformed with an attention to certain foods, eliminating some and adding some really important ones. From my experience, I believe foods play more of a substantial role in your skin’s health, especially if you are experiencing any condition like acne, eczema, psoriasis and severely dry and dehydrated skin, than most products and this is why I always incorporate skin nutrition consults as a core therapy for my clients in need of real results that last a lifetime. Herbs and Spices – Gorgeous glowing skin is greatly influenced by your body being hydrated on a cellular level and having a mineral rich diet will allow your cells to receive the water you are drinking everyday. Filtering water creates what is known as a chaotic environment and the molecule being so large too that your cells cannot absorb this fluid. Incorporating herbs like thyme, parsley, dill, oregano, sage and spices like cinnamon, Himalayan salt, and turmeric will feed your body so many vital trace minerals making it much easier for you to be hydrated on a cellular level and notice a less inflamed and a more supple and dewy skin. Teas – Herbs not only provide minerals to assist in you hydrating at a cellular level but they are loaded with powerful antioxidants as well to boost your immunity. A healthy immunity means a body that is better equipped to fight inflammation so get ready to notice skin conditions like acne and eczema slowly subside. Also, these antioxidants fight free-radicals, which destroy healthy cells and leave you susceptible to illness and disease. Sipping teas like green, white, rooibos, spearmint, peppermint, rose and rose hip are insanely beautifying and when you are consistent about incorporating them in your diet you will have unbelievable and transformative results. Colorful Foods – Yellow, red and purple foods contain powerful antioxidants known as carotenes that help your skin convert Vitamin A. This powerful skin-friendly antioxidant has cancer-fighting properties, and plays an important role in boosting your body’s own production of collagen. Vitamin A also helps to heal damaged skin and, in some cases, reduces the appearance of wrinkles. Foods rich in carotenes also heal to heal skin from UV damage and with nature’s perfect timing, it’s no wonder that so many carotene-rich foods are available in the fall and winter months. Berries – Berries are known for their incredible fiber content and antioxidant. Also, so interesting is that because berries have such thin skins, through evolution they have built an enormous amount of antioxidants to protect their own thin skins from the burning sun. How cool is that! A diet rich in berries is essential for anyone experiencing mild or severe acne and for the person who loves the sun and surf and is directly exposed to the sun on a daily basis. Berries like strawberries and blackberries are also high in ellagic acid, which can inhibit enzyme production in viruses, bacteria and fungi, preventing them from infiltrating and wreaking havoc on the body. Ellagic acid can also help protect skin from oxidative stress post UV exposure and also inhibits the enzyme, matrix metalloproteinase (MMP), that signals collagen breakdown and together, this encourages the maintenance and/or improvement of the skin’s elasticity. Healthy Fats – Incorporating as many healthy fats in every single meal will create a supple and youthful tone to the skin and is especially beneficial for people experiencing severely dry and prematurely aged skin. When you understand that every skin cell is surrounded by two layers of fat, that make up the cell walls then you can appreciate how a diet rich in healthy fats can create a plump and healthy skin. Essential fatty acids (EFAs) are essential because your body needs them but because your body does not make them, you have to get these beauties from foods. Omega-3s and omega-6s are the building blocks of healthy cell membranes and even the lesser known omega 7’s that you can get from virgin organic olive oil and sea buckthorn seed oil. These delicious fats assist the skin in maintaining a natural oil barrier, which is exactly what you want. Your natural oils protect the surface with healthy biomes and bacteria, are anti-bacterial as well warding off unhealthy bacteria and those natural oils are critical in keeping skin hydrated, plump and dewy. If your body is depleted of EFAs your skin will most likely be chapped, dry, inflamed, and prone to whiteheads and blackheads. Research suggests that EFA’s also slow down inflammation associated with acne. So load up on certified organic oils of flax, avocado, olive, coconut, sesame, borage and evening primrose. The latter two easily found in capsule form. Hello, I can not have caffeine would drinking decaf teas have the same effect? Previous Previous post: For Lymph’s Sake Isn’t It About Time You Say Goodbye To Antiperspirant? Next Next post: We Eat Way Too Much Meat!